We are a team of Realtors with the experience to make you feel "at home." Strong supporters of the Sarasota "Support Our Troops" mission and avid volunteers, we prioritize a sense of community in our real estate process and reflect a love of our home neighborhood at Heritage Oaks in Sunny Sarasota. 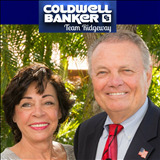 Glen & Lillian Ridgeway have specialized in providing professional real estate services within private golf communities, waterfront homes, estate homes, new home sales, vacant land, investment properties and more in the Suncoast area (Sarasota & Manatee Counties) since 1997. Get our complete Showcase of Homes online digest here.